News > Events > ET December/January is here! It’s the end of another year, and we’ve taken this opportunity to take a step back and reflect on what happened in the edtech sector in 2018. What new innovations came about? What events and initiatives were launched, and what topics were garnering the interest of experts across the sector? Our roundtable this month dives right into the heart of the question, where eight experts from across the edtech sector look back at their highs and lows of 2018, and tell us what they expect to see in 2019 and beyond. Check out their insights on page 37. On page 31 we have our special feature investigating the current status of the STEAM movement in education. We ask whether it is enduring, and what its highlights were over the past year. We hear from big players like HP, KidZania, and STEAMCo. about what they think the future holds for STEAM. Another hugely popular topic this year, for good reasons and bad, has been campus security. The HE sector has undergone a few blows from cyber attacks and leaks, and in this feature on page 51 we investigate the latest security technology being used across university campuses in the UK. Our look at paperless management on page 45 also provides an insight into how back-of-house tech can be just as crucial as the flashy front-end gadgets. 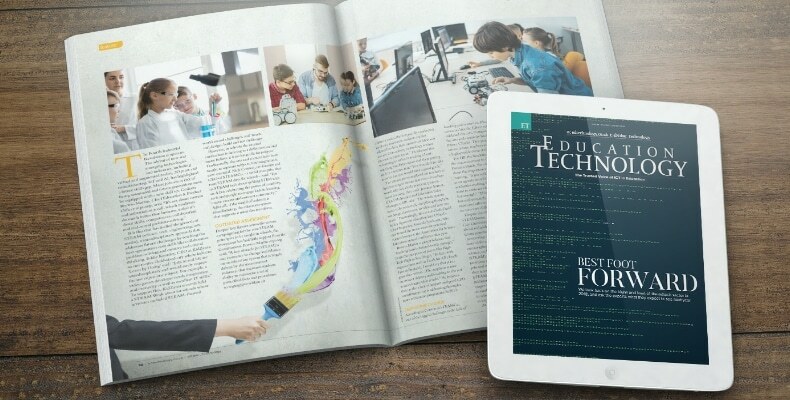 In this feature we ask what the evolution of paperless management will look like in 2019, and whether it is still essential for education institutions. Our timeline this month gives a breakdown of 2018 in edtech, highlighting some of the most prevalent moments throughout the year, from policy changes and investments, to awards and events. Also, in our profile we get to speak to Sophie Bailey, founder and host of The Edtech Podcast, about what she has seen throughout 2018, and what plans she has for the podcast in 2019. Hear all about Sophie’s top moments on page 59. All this, and lots more inside the mag! Last but certainly not least I would like to take this opportunity to thank all of our readers and contributors for their amazing support throughout the year. We have made a couple of big changes in 2018, and look forward to sharing our plans for 2019 and beyond with you soon. Happy holidays, and here’s to 2019!